Baseball, first dubbed the "national pastime" in print in 1856, is the country's most tradition-bound sport. Despite remaining popular and profitable into the twenty-first century, the game is losing young fans, among African Americans and women as well as white men. Furthermore, baseball's greatest charm--a clockless suspension of time--is also its greatest liability in a culture of digital distraction. 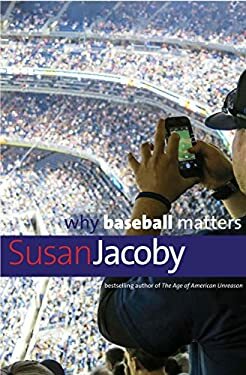 These paradoxes are explored by the historian and passionate baseball fan Susan Jacoby in a book that is both a love letter to the game and a tough-minded analysis of the current challenges to its special position--in reality and myth--in American culture. The concise but wide-ranging analysis moves from the Civil War--when many soldiers played ball in northern and southern prisoner-of-war camps--to interviews with top baseball officials and young men who prefer playing online "fantasy baseball" to attending real games. Revisiting her youthful days of watching televised baseball in her grandfather's bar, the author links her love of the game with the informal education she received in everything from baseball's history of racial segregation to pitch location. Jacoby argues forcefully that the major challenge to baseball today is a shortened attention span at odds with a long game in which great hitters fail two out of three times. Without sanitizing this basic problem, Why Baseball Matters remind us that the game has retained its grip on our hearts precisely because it has repeatedly demonstrated the ability to reinvent itself in times of immense social change.